Snorkeling is one of the best ways that absolutely anyone can experience the incredible views that are lying in wait underwater. Unlike scuba diving, going snorkeling requires no specialized training or expensive equipment – the only thing you really need to get started is a quality snorkel mask. Unfortunately, there are many snorkel masks out there that aren’t quite up to snuff. They’re either cheaply made, or worse yet, they don’t work properly. With that in mind, we’ve decided to put together this guide to show you some of the best available snorkel masks of 2018. Whether you’ve just recently picked up the ‘snorkel bug’ on a family vacation or cruise and want to buy your own snorkel mask, or you’ve been snorkeling all over the globe for years, we’re sure that you’ll be completely satisfied with any of the snorkel masks we’ve listed below for you. Can you breathe underwater with a snorkel? How do you attach a snorkel to a mask? How do you put on a snorkel mask properly? How do you properly fit a snorkel mask? What’s the difference between snorkeling and scuba diving? The first snorkel mask that we reviewed was this 180° view full-face mask designed for both adults and youth. With full-face snorkel masks becoming exceedingly popular in 2018, it only made sense to kick things off with this mask made by Fishhhhh. 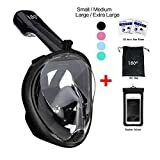 Along with the full-face snorkel mask itself, you’ll also be getting a free waterproof carrying bag, a waterproof phone case, and a couple of anti-fog wipes. The mask also comes in over a dozen color combinations, with multiple options for both adults and kids alike. There’s even a mount attached to the mask for your GoPro to permanently capture the amazing views waiting for you underwater. We really liked the panoramic field of view this mask offered. As with most full-face masks, it’s also a good option for novice snorkelers to get used to breathing naturally through a mask while in the water. While it’s much more effective at keeping water out of your mask compared to traditional types of snorkel masks, the snorkel did tend to let in a bit more water than we would’ve liked, especially compared to some of the other options that made our list. 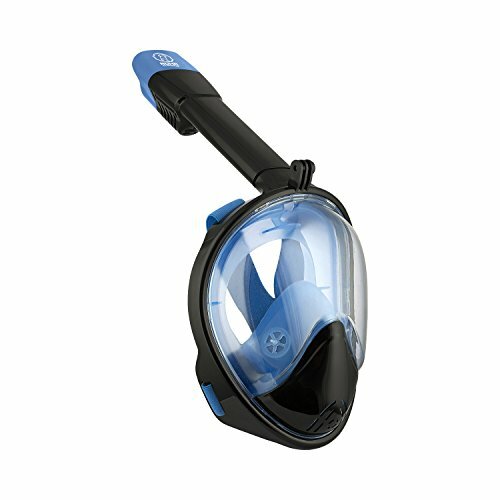 Next up is yet another full-face mask, the Boha AtlantiSea 180° snorkel mask. We’re big fans of full-face mask designs, although it should be said that they aren’t totally without risk. That’s exactly why we’re only recommending high-quality masks that meet our specific standards when presenting this list of the best snorkel masks for you. 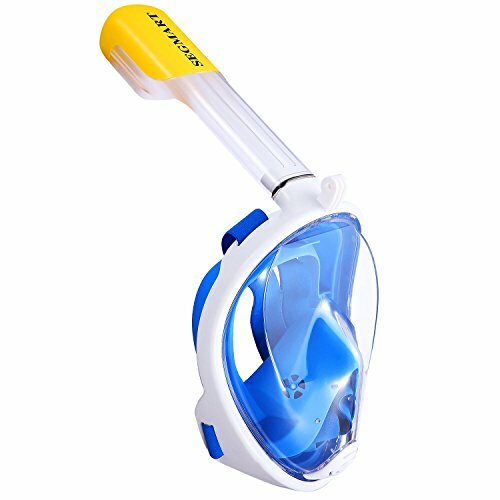 The AtlantiSea snorkel mask comes equipped with a dry top snorkel tube that will let you breathe naturally through either your nose or your mouth when using the mask. It also comes with a 180° panoramic visor and an attached GoPro mount. 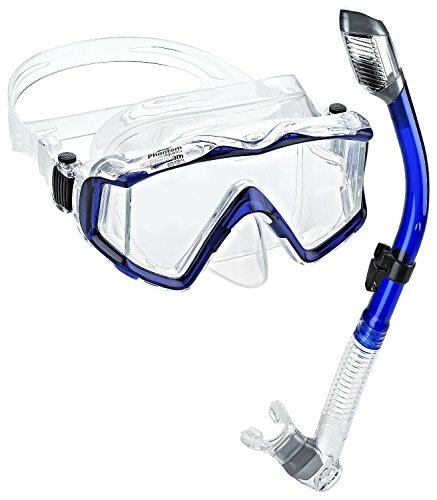 Without a doubt, our favorite thing about the AtlantiSea is that it’s an excellent snorkel mask for novice snorkelers. We’ve seen many people try out snorkeling with a traditional snorkel mask only to quit pretty much immediately thanks to getting a mouthful of salt water. That’s definitely not an issue with this mask – we had an outstanding snorkeling experience from start to finish with it. As mentioned above, we greatly enjoyed our time spent testing the AtlantiSea. The only thing we didn’t like was that near the end of our snorkeling session, the mask started to get quite foggy. However, it should be noted that this was after over 25 minutes of time spent in the water with no visibility issues whatsoever. 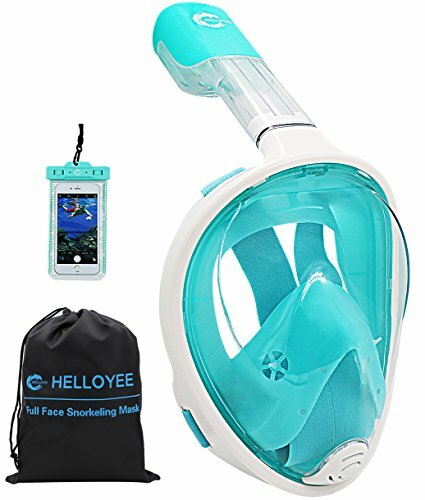 Continuing the trend of full-face snorkel masks, the next entry on our list is the HELLOYEE full-face snorkel mask. HELLOYEE have managed to make an outstanding full-face mask that offers everything you could ask for at an extremely attractive price point. This particular mask is the third generation of this mask, with each iteration building upon the last in new and innovative ways. As a full-face snorkel mask, you’ll be able to breathe underwater through your nose or mouth without needed to bite down on any kind of mouthpiece. An innovative full face and ball system work in tandem to make things easy for you, while an outstanding panoramic view means you’ll be able to take in all of the underwater details. An attached camera mount along with anti-fog and anti-leak engineering help to round out one exceptional snorkel mask. Our biggest take away after testing out HELLOYEE’s new snorkel mask was how well it worked. You can definitely tell that they’ve been constantly tweaking and improving an already winning formula with this being version 4.0 – and the fact that you can such a quality mask for about $20 is incredible. Honestly, the only fault that we could genuinely find with this snorkel mask is one that’s shared by the majority of full-face masks – the fact that there’s always the risk of CO2 buildup occurring. The fourth entry on our list is also the first – and only – entry that isn’t a full-face snorkel mask. Phantom Aquatics have released a traditional panoramic scuba mask and snorkel set that is of such a high quality that it was simply impossible to leave it off of our list of the best snorkel masks of 2018. Phantom Aquatics have built quite an impressive snorkel mask with a patented tempered glass single-lens design with a seamless side window that allows for a panoramic field of vision. The mask also has a fez equalize nose pocket and a crystal-clear double-sealed silicone skirt that offers an exceptionally comfortable fit. And last but not least, the snorkel itself has a large exhaust and purge valve at the bottom that makes clearing water a breeze. The two things that impressed us the most with this mask are the fantastic panoramic views and the incredible high-quality construction of the mask. Everything from the mask lens to the skirt to the snorkel is built to last. The only noticeable flaw that we could find with this mask is that it definitely gets a little fogged up. However, as with most snorkel masks, you can easily remedy this issue by placing a bit of toothpaste inside the mask and leaving it to sit overnight before rinsing it out. Mask lens can get fogged up quite easily. Rounding out our list of the best snorkel masks of 2018 is this SEGMART 180° view panoramic full-face mask. Designed for surface snorkeling in less than 10 meters, snorkeling enthusiasts will find a lot to like with this mask. Your whole family can get in on the fun with this mask as well, as SEGMART makes versions for both adults and kids. SEGMART have designed a full-face snorkel mask that has all of the features that we look for. It’s got a high-quality silicone skirt, easy-to-adjust strap buckles, a panoramic field of vision with an anti-fogging design, and dry snorkel technology to help keep the saltwater out and the air in. The thing we love the most about nearly all full-face snorkel masks is how easy they are for absolutely anybody to use, and this mask was no exception. It made it a breeze to breathe naturally underwater, and the anti-fogging design actually worked great compared to other full-face masks out there that are a similar price. The only negative we noticed with this mask is that the ball located inside of the snorkel can end up coming off if you aren’t careful. This only happened a couple of times, but it was enough of a hassle that we had to point it out. While we’ve provided five fantastic snorkel masks for you to choose from with the reviews above, we also recognize that some readers may prefer to go out shopping for their own. If that’s the case, you’ll want to have a read through this brief snorkel mask buyer’s guide as it will highlight exactly what you should be looking for when purchasing a snorkel mask. Hard plastic, metal, frameless – there’s an incredibly wide variety of snorkel masks available to hobby enthusiasts in 2018. One of the main ways that many of these masks differ from one another is in the material that their frame is constructed from. Traditionally, most snorkel masks featured either a hard plastic or a metal frame. In recent times however, frameless snorkel masks have become quite popular, and they are generally what we would recommend for most snorkelers. They’re simply less bulky to wear and most frameless snorkel masks provide a better field of vision. Another important consideration when shopping for a snorkel mask is the weight of the mask. This will largely be decided based upon the type of frame type the mask has, as well as the material used for the lenses. For obvious reasons, it’s a good idea to steer clear of snorkel masks that are overly bulky – there’s nothing more uncomfortable when snorkeling than having a heavy mask weighing you down! The size of your snorkel mask is another factor that should influence your decision. We tend to prefer full-face snorkel masks over more bulky traditional masks for a few reasons, such as improved field of view, comfort, and ease of use. Other than the frame (if you’re not going with a frameless mask) and lenses, you’ll want to make sure the rest of the material used to make your mask is of a high quality. For the skirt in particular, we strongly recommend that you go with one made of silicone. It will feel vastly more comfortable against your face for longer snorkeling sessions than a skirt made of plastic will. The first thing to keep in mind when it comes to snorkel mask lenses is you should always go with a mask made with impact-resistant glass – never plastic. Aside from that, you’ll have a few different options as far as how many lenses your mask might have – anywhere from one up to four lenses depending on the type of mask and frame. Perhaps the most important consideration of all when buying a snorkel mask is how well the mask fits you. The perfect fit for a snorkel mask is one that fits comfortably and remains sealed with submerged without having to tighten the straps too much. Feel free to consult our FAQ section below for more details on how to properly fit a snorkel mask. Many novice snorkelers are surprised to learn that it’s indeed actually possible to breathe underwater while snorkeling – to an extent. If you’re using a traditional snorkeling setup of a mask with a tube sticking out of your mouth, it’s obviously going to be impossible for you to breathe underwater. As soon as you went below the surface, you’d end up with a mouthful of salt water, unless you held your breath. That’s actually one of the main reasons many would-be snorkelers hold off on attempting the hobby – they’re worried about accidentally getting a mouthful of water. However, with that being said, underwater breathing is still possible when snorkeling so long as you’re wearing a full-face snorkel mask with a dry top that will prevent water from entering the mask. It’s important to note that there are still limits though. Most full-face snorkel masks are designated for surface snorkeling up to a depth of 10 meters – you’ll never want to try and use a full-face snorkel mask for freediving. For surface snorkeling with just a few brief dips underwater, you’ll be just fine with a full-face snorkel mask. That’s exactly why the majority of the snorkel masks we’ve covered in this article are full-face masks. If you’re using a traditional snorkel mask, the first thing you’re going to want to do is put on your snorkel mask. Put the mouthpiece into your mouth and line up the tube to the side of your head on whatever side feels most comfortable for you. Next, you’re going to want to move the plastic clip into position along the side of the mask strap. Once you know where you’ll want to clip it in, remove the snorkel mask and thread the clip into the strap. Finally, put the loose strap into its holding clamp located on the side of the mask, and voila! It’s that easy to attach your snorkel to your mask. Before putting a snorkel mask on, you’ll first want to follow the instructions described in the answer above to attach the snorkel to the mask. With that out of the way, you can just go ahead and put the mask on. You may need to re-adjust the straps a little bit to get it to feel just right for you — more on that though with the next question we’ll be addressing concerning properly fitting the mask. While putting your snorkel mask on may be rather straightforward, making sure that your mask properly fits is another story entirely. A proper fit is probably the single most important thing to keep in mind when trying out any snorkel mask. Nobody wants to be stuck in the water, constantly readjusting their snorkel mask instead of enjoying all of the beautiful underwater views. With that in mind, let’s discuss the skirt found on the snorkel mask. If you’re scratching your head wondering what that means, the skirt is simply the point of the mask that makes contact with your face. In an ideal situation, the mask will create a watertight seal against your skin that prevents water from leaking in while you’re snorkeling. The best way to ensure that your mask will fit properly is to first hold your breath. Press the snorkel mask against your face gently while still holding your breath, and let go of it. If the mask fits you properly, it will remain pressed against your face. This simple procedure will take you less than five seconds to perform but it will immediately weed out any mask that won’t be a proper fit for you. Once you’ve got the right mask fit for you, there’s still one more important point to keep in mind. When adjusting the straps with the mask, you should only have to tighten them enough to prevent the mask from sliding around when you’re moving your head. The seal should mainly be coming from the skirt, not tightening your straps. In the most simple terms possible, snorkeling is simply swimming along the water’s surface while looking down at the view below you. On the other hand, scuba diving requires specialized equipment (wetsuits, air tanks, regulator, etc.) and involves diving beneath the surface to some pretty extreme depths. To go into more detail, one of the biggest differences between the two is that absolutely anybody can go snorkeling. Rental equipment is readily available at most popular snorkeling locations around the world, or you can purchase your own snorkel mask for use. Simply grab a snorkel mask, jump into the water, and prepare to be amazed by the incredible views that are awaiting. Meanwhile, scuba diving requires specific training in order to become certified (the PADI Open Water Diver course is generally accepted as the standard around the world). It’s also possible to take a basic one day introduction to diving course as well to test the waters – no pun intended. These courses are designed to get divers comfortable with using their equipment, breathing underwater, and to teach them what to do in emergencies. We’re huge fans of both snorkeling and scuba diving and we would strongly encourage everyone to give them both a shot! While you really can’t go wrong with any of the snorkel masks that we’ve covered above, in the end there are two of them that we would recommend to readers as the best of the best. Which one you choose will depend on what kind of snorkel mask you want to go with – a full face option or a traditional one. Full-face snorkel masks are fantastic for their ease of use, but they do carry the risk of CO2buildup which can be a concern for some people. On the other hand, a traditional snorkel mask setup can work great, provided you go with a high-quality option. The Phantom Aquatics scuba mask and snorkel set is our top pick for a traditional set as it was the only one to crack our top five. If the risk of CO2 buildup with a full-face mask is too much for you, then this is the snorkel mask you want. When it comes to choosing a winner out of the four full face options, things get a bit tougher. In the end, we had to give the nod to the HELLOYEE full-face snorkel mask. It just does too many things right at an incredibly attractive price point. As a third generation mask, it has continued to build and expand upon a winning formula, and its high quality shines throughout.